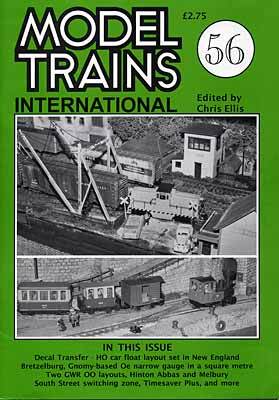 Musing on the events of the past 25 years of activity from the beginnings with Model Trains in 1980. Further notes and thoughts on a HO layout based on a classsic American track plan for a switching layout relating construction, development and a unique method of operating. Two US trackplans in HO, one 10ft x1ft 6in, the other 9ft x 8ft x1ft 6in to capture the character of busy freight operation. GWR through station layout 9ft x 1ft 6in in OO. The 4ft long addition to the OO GWR branch terminal "Melbury', (SMT 10/11 88, 1/89) of an engine shed and carraige siding added further realism and operating potential. The evolution of and thinking behind a ingenious and imaginative HO American shortline layout with car float ferry operation in addition, 6ft x1ft . Development of the American or European switching Tuning Fork layout, 51ft x 6in. See also issues 45, 46 and 47. Development of the Tuning Fork idea and based on the BTRR, 55/16, in 7ft x 1ft 3in. A small, 6ft x1ft, simple N gauge British Rail terminus set in North Devon and built on a folding baseboard. Narrow gauge stock made using a Peco N gauge chassis and a Lesney stake truck body. Article What's in a name? Useful comments on the art of selecting a suitable place name for your layout, with remarks as to how the author makes his.